I feel as though the financial markets are carefully and systematically setting the stage for the next leg down in this current depression. Churning through the financial data released all last week paints a frightening picture. I would like to take a moment and discuss each domino carefully being set. When Phil Jackson entered the NBA Finals as coach of the Lakers he had won 100% of the playoff series he coached after winning game 1; he was 47-0. This was disturbing to me when the Celtics lost game 1 of the series. True to history, the Lakers ended up winning and his streak remained perfect. 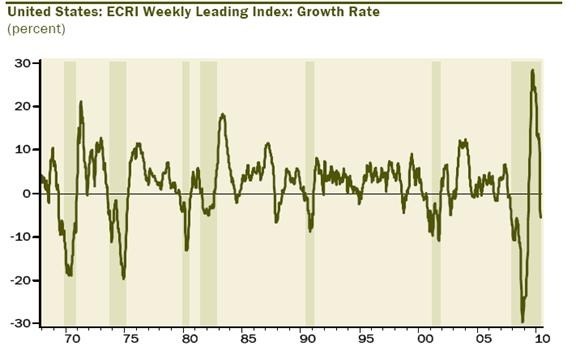 The ECRI weekly leading indicators are measured by a single number placed on a graph. When the number crosses above 0 and goes positive it usually means we have entered a period of economic growth and is positive for the stock market. 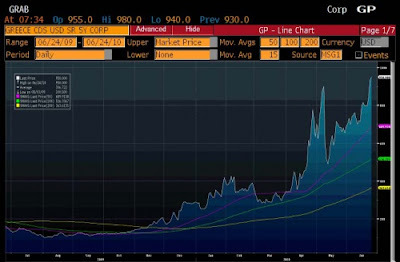 When the number crosses below -10 on the chart it means the economy is heading for recession and contracting, which is very negative for the stock market. How often has this occurred after crossing below -10? 100% of the time. The same record as Phil Jackson. 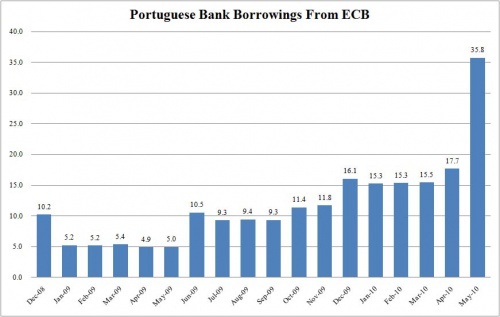 The contagion continues to spread around Europe as Portuguese banks borrowed more money from the ECB last month than ever before. (ECB is Europe's Federal Reserve) The chart below shows this massive increase in money borrowed representing the strain on the banking system. The same problem is taking place in Spain, only at a much faster pace as the banking system is freezing up across the board. Over here in America the same event is taking place only it is at our state level. Bloomberg reported on Friday that 46 States are massively underfunded and now face Greece-like fiscal emergencies. This week Illinois passed California as the most dangerous debt in the country in regards to cost to insure. (CDS) The chart below shows their rapid rise. Look for more and more states to accompany California and Illinois on the troubled list as we move forward. GDP (the size and strength of our economy and what creditors use to estimate our ability to pay debt) was revised down this week to 2.7%, a sharp revision lower. The housing market continues to roll over in every category as I discussed in detail this past week. Unemployment continues to remain elevated, and the largest component of the money supply, M3, is falling rapidly as can be seen in the chart below. 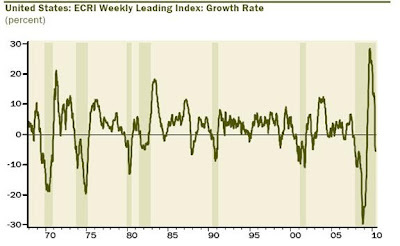 (Blue Line) These are some of the components of the ECRI weekly economic indicator discussed above. For the seventh week in a row American equity (stocks) mutual funds have seen massive withdrawals. 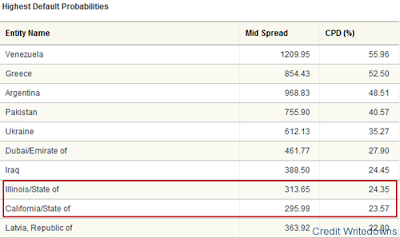 Americans continue to pull money from the stock market and put it into bond funds. The market has been held up thus far by the commercial banks and high frequency traders. If they decide they do not want to push this market higher, look out below, as they also have the ability to turn on a dime and short the market if it moves lower. Outside of the brief period during the credit crisis in the fall of 2008, the 10 year treasury bond is now at the lowest point since 1962. It crossed under 3.11% this week, which signals to the markets the fear and distrust in the system, similar to what we saw leading into the last credit crisis. 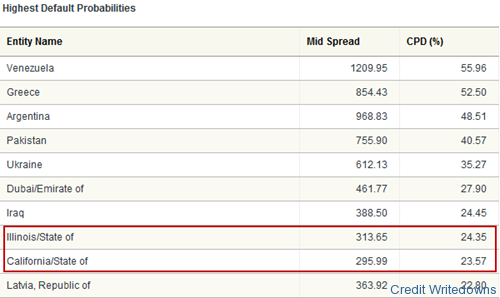 As I stated above this paints a very dangerous picture for the economy and credit markets moving forward. The dominoes are now set and we wait to see what will represent the small push the markets need to topple.